Airy is a flexible and solid WordPress theme, perfect for any blog or online magazine website. This theme is carefully crafted with attention to details and love. Airy is simple, lightweight and easy to use. 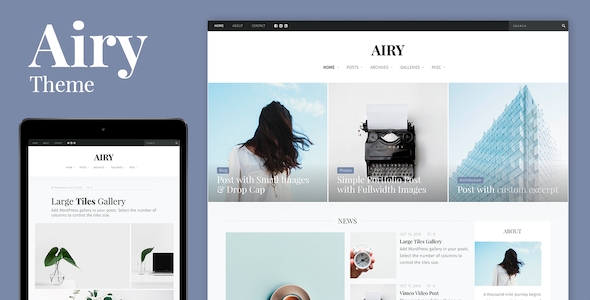 Airy is a modular WordPress theme. It has been designed with flexibility and easiness of use in mind using widgetized page approach. With simple Flexible Posts Widget you can select posts by category, tag, post format, etc. Airy theme provides a lot of beautiful templates for this plugin. You can use some of this templates to add stylish recent and featured posts section to sidebar or build your own homepage layout. This way, you can add, remove or re-arrange the sections (widgets) on your homepage, or any other widgetized page without need to install heavy and cluttered Page Builders. Create posts with or without an excerpt, add beautiful galleries, videos and audios to your website. Use different post layouts (narrow, wide or right sidebar), optionally disable post meta info. You can select between 10 different layouts for your home page, archive pages, author pages, search results pages, tags and categories. Beautiful carousel and slider widget template. Enhanced native WordPress galleries with Lightbox Slideshow. All your galleries and media content will be safe if you decide to change the theme â€“ no custom fields used to store your content. Optional Sticky Top Bar Menu and Sticky Sidebars. Compatible with MailPoet Newsletters, WP Instagram Widget, Latest Tweets Widget, Contact Form 7, Social Likes, SimpleMap plugins. A number of layouts for Flexible Posts Widget plugin. Supports Latin, Latin Extended, Cyrillic Google Fonts subsets. More subsets could be added by request. Cross-Browser Compatibility: FireFox, Safari, Chrome, Opera, IE10.